A quick and easy recipe that uses multiple items from this weeks Share (especially if you have the Mushroom Share too!) is a classic featuring cauliflower as the hearty main. It comes together in under an hour, mostly due to roasting time. Often when I pick up my Share, I’ll pre-roast a big pan of vegetables all at once to use throughout the week. You can do that with this dish as well for the roasted items, reheating it all in the same saute pan used to cook the bacon for a quicker, weeknight meal. This version comes from Food Network’s blog. Feel free to use it as inspiration and toss in herbs of choice, swap white wine vinegar for whatever you have on hand, etc. The dish will not suffer. 1. Put a baking sheet on the bottom oven rack and preheat to 450 degrees F.
2. Bring a large pot of salted water to a boil. Add the green beans and cook until crisp-tender, about 4 minutes. Drain and rinse under cold water. Pat dry and transfer to a large bowl. 3. Meanwhile, toss the cauliflower with 2 tablespoons olive oil, 1/2 teaspoon salt and a few grinds of pepper in a large bowl. Transfer to the hot baking sheet and roast, tossing once, until tender and golden brown in spots, about 20 minutes. 4. Heat 1 tablespoon olive oil in a large skillet over medium heat. Add the bacon and cook until crisp, about 3 minutes. Remove with a slotted spoon to a paper towel lined plate to drain. Increase the heat to medium high and add the mushrooms and the shallots to the skillet; season with 1/2 teaspoon salt and a few grinds of pepper. 5. Cook, stirring occasionally, until tender and golden, 5 to 6 minutes. Stir in the vinegar, parsley and tarragon. 6. Transfer the mushroom mixture to the bowl with the green beans. Add the cauliflower and bacon; drizzle with the remaining 3 tablespoons olive oil, season with salt and pepper and toss. 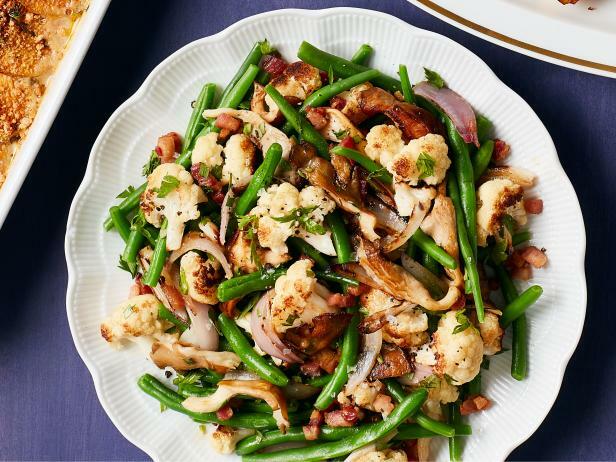 This entry was posted in Recipes and tagged cauliflower, green beans, mushroom share, shallots, vegetable main dish by Jennifer Moore. Bookmark the permalink.